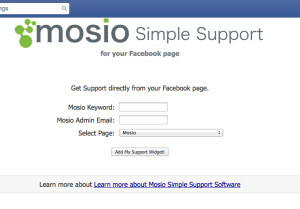 Step 2: Enter in your Keyword, an email address of one of your admins, then pick the page you want to add the app into. Step 3: Click on Last Step: Add it to your page and then choose your page in the drop down. If you want to change the color or title of the button, click on the little Edit Tabs button (see image below) until all of your tabs are showing, then the pencil and choose Edit Settings. You’ll see a little pop up that says “Edit Mosio Settings” and you can add a Custom Tab Image or Custom Tab Name. Add your custom tab or custom name and you’ll see it on your page. 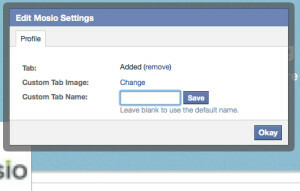 Users who click on your tab will be taken to a page inside of Facebook where they can ask their question. All questions will post to your microboard like they do now, enabling patrons to start a live chat (if you’re logged in) or choose to be responded to via email or text message.